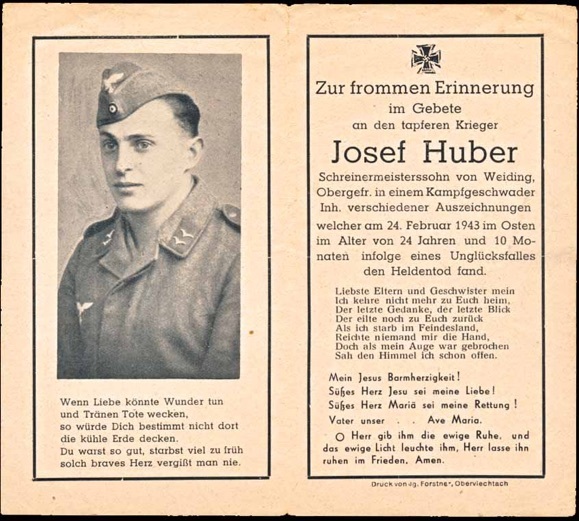 WW2 German Death Card (Sterbebild) for Luftwaffe Obergefreiter Josef Huber, Kampfgeschwader. Master carpenter’s son from Weiding. Killed in an accident in the east, 24 February 1943. He was 24. Double page single sided card measures 5.75 x 5. 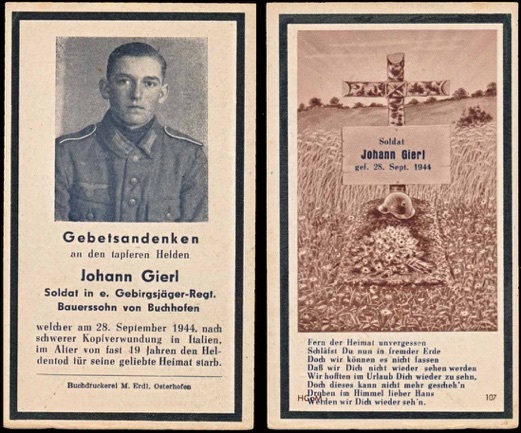 WW2 German Death Card (Sterbebild) for Army Soldat Johann Gierl, Gebirgsjaeger Regiment. Farmer’s son from Buchhofen. Died of a difficult wound to the head, 28 September 1944, Italy. He was 19. Back of card has rendering of his grave. Single sided single page card measures about 4 x 2.5 inches. Includes a slip from the German Graves Office listing him as buried in Costermano, Italy. 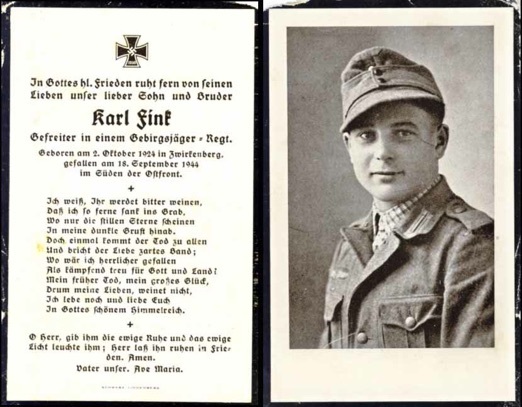 WW2 German Death Card (Sterbebild) for Army Gefreiter Karl Fink, Gebirgsjäger Regiment. Killed on the southern part of the East Front, 18 September 1944. He was 19. Includes a slip from the German Graves Office listing him as killed in the area of Reghin, Mures and buried in Sibiu, Romania. Card looks to have been carried. 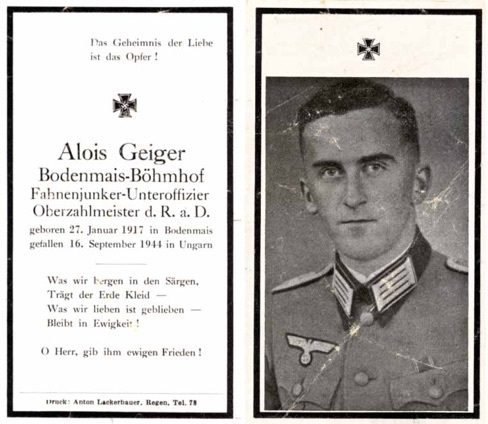 WW2 German Death Card (Sterbebild) for Fahnenjunker-Unteroffizier and Oberzahlmeister Alois Geiger. From Bodenmais-Boehmhof. Killed 16 September 1944 in Hungary. He was 27. Photo shows him in officer’s uniform with single ribbon for the Czech Anschluss Medal. Single page double sided card measures about 2.25 x 4.25 inches. Includes a slip from the German Graves Office listing him as killed and buried in Hodac, Romania. Card has a little wear, mostly to the photo. 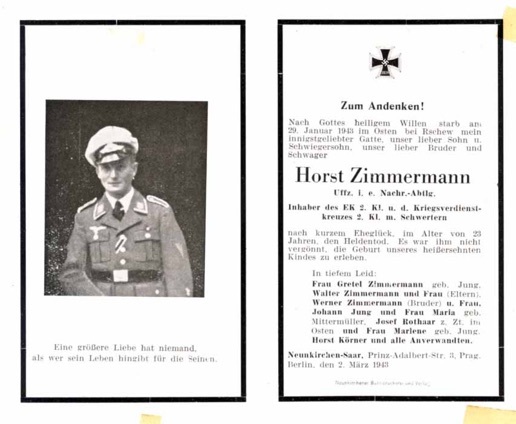 WW2 German Death Card (Sterbebild) for Luftwaffe Unteroffizier Horst Zimmermann, Nachrichten Abteilung. Was awarded the War Service Cross 2nd Class with Swords and the Iron Cross 2nd Class with Swords. Killed in in the East by Rschew, 29 January 1943. He was 23. Back of card has an Iron Cross and a cross. Single sided double page card measures about 5.5 x 4.5 inches. Very good condition with three small tape marks. 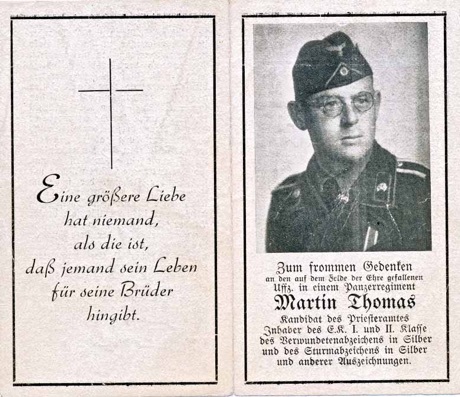 WW2 German Death Card (Sterbebild) for Army Unteroffizier and Funker Martin Thomas, Panzer Regiment. Candidate for the priesthood. He was awarded the Iron Cross 2nd Class, Iron Cross 1st Class, Wound Badge in Silver, the Assault Badge in Silver and other medals. Called to military service June 1940, he went to the East front and saw combat at the Kuban Brdigehead and Dnjeperbogen. He was wounded three times and his fourth wound ended his life. In a night attack, he was killed by the round from an anti tank canon, 16 December 1943. He was 29. One brother was killed September 1942. Another was MIA january 1942, and another was recoverig from wounds in Norway. Double page double sided card measures about 4 x 5.5 inches. Includes a slip from the German Graves Office listing him as KIA at Nowgorodka. WW2 German Death Card (Sterbebild) for Army Radio Operator Hubert Blatt, Assault Engineers Battalion. Killed by Jüterborg (Germany), mid March 1945. He was 20. Nice photo with Reichsarbeitsbienst Obervormann collar tabs. Back of card has helmet and a cross. Double page single sided card measures about 4.5 x 5.25 inches. 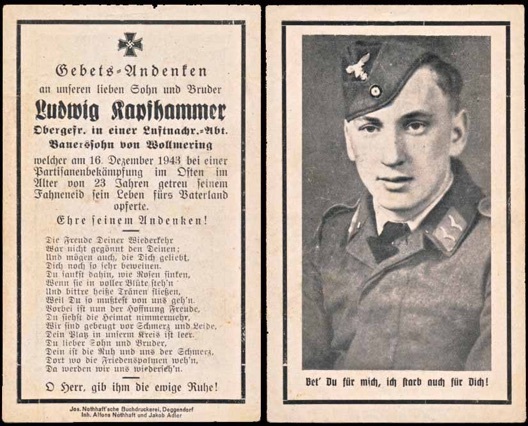 WW2 German Death Card (Sterbebild) for Luftwaffe Obergefreiter Ludwig Kapfhammer. Luftwaffe Nachrichten Abteilung. Farmer’s son from Wollmering. Killed fighting Partisans in the East, 16 December 1943. He was 23. Single page double sided card measures about 2.75 x 4.5 inches.